On this episode, Fabian talks with 26-year old Dutch identical twins Raissa and Joyce de Haas, who have built Double Dutch, a London-based brand of award-winning premium mixers that sold well over 10 million bottles to date. We dive into the story from idea to shelf while building a beloved brand along the way. Talking with the de Haas twin sisters about their brand of premium mixers: How they managed to build a beloved brand at a young age (all while finishing their masters degrees and having started careers in finance). We talk about their story from idea to bottle to shelf, the advantages of having a co-founder, how the brilliant name Double Dutch came about (yes, it all happened at a bar), how the brand’s fun copy has come together organically over the years and why Joyce and Raissa (who made it onto the Forbes 30 under 30 list this year) wish they would have paused and created a more cohesive visual and verbal brand when they saw initial interest in their products. F Geyrhalter: Welcome to Hitting the Mark. 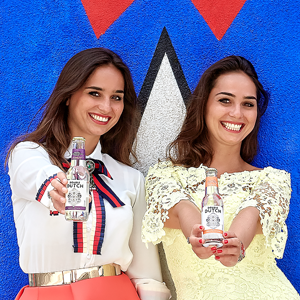 Today we travel to London, via the Netherlands as we welcome identical twin co-founders, Raissa and Joyce de Haas, whose award-winning premium mixers “Double Dutch” are winning craft cocktail fans hearts around the world, while gaining international attention for their innovative take on sodas and tonics. I first came across the brand in Europe, and then a few weeks ago, I noticed Raissa being featured on the 30-under-30 list by Forbes, where they had the following to say about the brand. “The de Haas twins, born in the Netherlands, are the co-founders of Double Dutch Drinks; a range of soft drinks developed specifically for pairing with higher quality spirits including gin, whiskey, rum, and tequila. Since its 2015 launch, the London-based brand has sold 10 million bottles and raised 1.9 million British pounds. The drinks are available in 22 countries and they’re sold in more than 4,500 outlets, including Michelin-star restaurants, luxury hotels such as the Savoy and the Mandarin Oriental, as well as 2,000 supermarkets.” With that being said, welcome Raissa and Joyce. F Geyrhalter: Hey, it’s great to have you here! So first off, I’m a big gin-tonic fan, too bad it’s early in the morning when we record this, my time. For you it’s already in the evening. But gin itself, the history of it, it actually traveled just like you from the Netherlands to London, correct? Gin actually comes from the Netherlands. Raissa: Yes, very much. The Dutch, they invented it decades and decades ago in the Netherlands and actually the Dutch King of Orange, he was on the tour here in the UK and he just banned everything that was not Dutch. Then he started importing it into the UK and that’s how gin became so popular here in London as well. F Geyrhalter: And you followed the trail of the inspiration. That’s great. Let’s talk a little bit about your backgrounds. So, molecular gastronomy, such a big thing in Northern Europe. Is that your background? Or, how did it all start? It seems like you were right on the zeitgeist with your idea. Less than a year ago, the conglomerate Ketel One released Ketel One Botanical, doing essentially a similar thing by harnessing the flavors of herbs and fruits without sugar, making it artisanal, craft style cocktails that have more flavor and are more balanced. What inspired you to be on the forefront of what now became a trend in the beverage industry? You started the concept while you were in college, right? Tell us a little bit about that story. Raissa: Yeah! We always grew up with our parents in the Netherlands. They always were big gin drinkers and they had a little wine and spirit shop in our garden, basically. So, we kind of grew up building a big passion for spirits. We knew lots of the local distilleries and just grew up a little bit drunk. Then, we moved to Belgium to study at university and everyone in Belgium drinks beer, obviously. We always grew up with quality spirits so, at university we threw parties on Wednesdays and Thursdays at our flat. We kind of put a ban for people who came to our parties to bring beer. We told people to bring different bottles of gin or vodka or tequila to our parties, and then Joyce and I would make different sodas in our kitchen for the week ahead. It was very primitive, we would just, for example, heat up strawberry and mint in a saucepan, add sugar, then you get a syrup, and then add carbonized water. We did that for a couple of years, did it just for fun, and just did it because we thought the choice of gins, vodkas and spirits was so big but the choice of mixers and tonic waters was boring. So we just started experimenting with different flavors. We did that for fun, kept doing it for friends and family, and then graduated, both in finance actually. I started working for a small, private wealth management firm in Antwerp and Joyce started working for a bigger corporate bank in Brussels. But soon, after four months, we decided that finance wasn’t maybe for us. F Geyrhalter: You had to go back to drinking. Raissa: Exactly! We wanted to follow our passion for drinks. We decided to move to London, study the second Master here in technology, entrepreneurship and basically devoted our year about the beverage industry here. We wrote a dissertation about the fact that spirits were becoming more and more experimental. There was this whole gin hype and movement and spirits was definitely becoming more popular. But again, we saw in the UK and in London, tonic waters and mixers were pretty standard and we decided to write a dissertation about that. Our end goal was basically to develop a range of mixers and tonic waters that were more innovative, that were more exciting, that offered more choice, and we brought something different to the market. We eventually launched, after we graduated, with cucumber and watermelon, and pomegranate and basil. Two very different flavors. We wanted to launch with one more summery, more fresh flavors so cucumber and watermelon, and one more botanical herbal flavor which is the pomegranate and basil. Just launching those two and adding different flavors across the years to the drinks. How we came into the flavor development, all our recipes are actually based on flavor pairing techniques. We look at our flavor development model from a molecular pairing point of view and for example, it’s basically the same kind of way how Michelin-star restaurants and chefs make their menus together. F Geyrhalter: That’s amazing. That is such a great story. You say you launched it, and you say it’s so easily. But breaking into the food and beverage industry, into that market, is super difficult. There’s so much that goes into it, just understanding all the rules, understanding the suppliers and how to get on the shelf. You say it like it was “oh and then we launched.” But really, how did you get all the contact? You basically at that point were straight out of school, straight out of your masters, you did a dissertation. But at that point, how do you actually go from that idea, even though you’ve already mixed the product and you have that idea? How do you go into packaging and getting on shelves. That’s a whole big step right there that we didn’t discuss. Joyce: I think for us it was challenging because we were only living here in London for less than a year. So, we didn’t really know anybody, we didn’t really have family, friends that could advise us on contacts and little things like legal advise, those kind of things. I think that was definitely challenging. But, I guess we were, the two of us were just stop and start knocking on doors, we were gonna stalk every potentially beneficial person on Linkedin and that’s just how we started growing our network. Then we randomly, we found this guy who helps startups find bottling plants, helps startups make recipes more commercially, somebody who is, just this one man band who gives consultancy to startups on how to commercialize, basically your recipes at home. He helped us also find bottling plants. We find little bottling plants here in North London. They had 2 machineries, very small [inaudible 00:08:24] labeled all our bottles ourselves overnight. It was a lot of long nights. F Geyrhalter: The good old days, the good old days. Joyce: Then basically we had our first six stars in bottles and that’s where we just went to London which we had this list of [inaudible 00:08:42], restaurants, and bars and hotels we talked and they would be amazing as our first customers. People were actually really open to try people. Then, I think in London, maybe everybody just was so helpful. We would have one bartender who really liked it, he would say like “oh but I have a friend there and I have another friend whose working there. Go there with my regards. He’ll take your product on.” I think it just moved step by step, slowly from there. F Geyrhalter: Isn’t it surprising, in large metropolitan cities like London that there’s so much human kindness right? And that people just want to help get you to the next place. Raissa: Yeah, for sure. I think people are just really supporting starting businesses people who wanna do something different. Then I think, yeah, that we really showed off. Joyce: Yeah, so very grateful for this. F Geyrhalter: Oh, I’m sure and there was a lot of hustle. You guys literally walked personally from bar to bar and trying to just get the product into the right hands. So, it’s not like it came easy in any way. Joyce: No, but it was fun as well. F Geyrhalter: Oh absolutely! I did read that you received the support of none other than Sir Richard Branson. What was that the big breakthrough moment for your brand? I think it was a startup competition that you won, correct? Raissa: Yes, exactly! He awards most innovative food and beverage brands in the UK every year. We won it after we launched three or four months later. So that was amazing and definitely was a turning point which was really quickly after we launched. So we were very lucky to win that. It just gave us incredible credibility with potential customers, gave us a massive amount of press nationally and internationally, and kind of gave us that headstart. That really helped us massively. Raissa: Our first shop was Harvey Nichols in London and after that, I think, Fortnum & Masons, which was amazing. Then Selfridges just took us on and all the other department stores. F Geyrhalter: And then it just kept going, exactly. F Geyrhalter: I mentioned Richard Branson, but look I’m in L.A. and we’re known for our celebrity culture. So let’s just stick to the most mesmerizing of characters out there with whom you seemed to co-mingled day in day out, if I look at your Instagram account. I have to ask, how was that meeting with the late and great Karl Lagerfeld? Did you chat it up or was it just more for photo opportunity? But I’m just so mesmerized that there’s the two of you and Karl Lagerfeld. F Geyrhalter: Has nothing to do with branding whatsoever. Joyce: It was a very long time ago. Actually before we started Double-Dutch, we met him or quickly saw him in a bar on holiday. Then we thought, we’d just go up to him, ask for like a [inaudible 00:12:07]. Raissa: And he was actually very nice. It was a fun evening. Joyce: Yeah, it was a really a good evening. F Geyrhalter: That’s fantastic. Looking at Karl Lagerfeld, you never would say he’s a funny person or a fun person, right? Because, he has this certain look about him. But, look it’s personal branding and I think the two of you are very much about personal branding too, right? It’s the whole idea of Double-Dutch and the twin sisters. How is that working with your twin sister? I guess one of you should step out of the room now. One at a time. But, tell us a little bit about the challenges. Because, I know a lot of founders say, “look, I need a co-founder, it’s better to have a co-founder.” A lot have co-founders and then things don’t work out. For the two of you, are literally by birth and now all the way into the actual company, so attached to each other as a personal brand. How does this work? Or, what are some advantages, what are some challenges? Joyce: I think it’s great. I think you’re right. I would recommend everyone to have a co-founder. But, to be able to do it with my twin sister is amazing because we can 100 percent trust each other, anytime, even if we might disagree or we would fall out. We wouldn’t really fall out for more than half an hour and then we have to make up again. I think it’s just amazing. We’re always on the same kind of thinking and even if we’re not, it’s not a big deal. We don’t need to tip toe and be careful to say what we think. We just say how it is and that’s that. Yeah, I think it’s great. Raissa: Do you Joyce? No, I do love it. I think there’s not really any challenges that I can think of. The only thing is that our sister life has become so much integrated in business that, we guess, we came here together in London, we have very much the same friends group and we go on holidays together, and everything’s so integrated with each other. But, that also means that we can just never switch off from Double-Dutch because when we’re drinking and we’re in a bar, we’re having fun, 100 percent Double-Dutch will come up at some point. Because we’re like, “oh! have you ever thought about that?” It’s always Double-Dutch. There’s not really any leisure time off from it. Raissa: I think, if we probably would not have started the business together then that would have probably been a bit less. Nevertheless, I mean, it’s both our baby so we love it. I think, it’s amazing to just do it with the two of us and especially, because we have had such a similar journey and we’ve always been super close together. We don’t have any other siblings, so yeah, I think, it’s really really great. F Geyrhalter: That’s great! Now that was a fantastic answer by both of you. It’s not different with a lot of co-founders that are married to each other, where they spend a lot of time together and then afterwards they have to figure out how not to talk about work. The two of you are constantly together and then you have to figure out how to not talk work. I think, you should just not go to bars anymore. I think, you should just have a complete sober lifestyle, which of course would ruin your brand. Alright, let’s switch it over to talk branding a little bit. Let’s talk about the name Double-Dutch. There is so much thought that must have gotten into it, or maybe it was just like this quick idea that you had. But, I noticed at least 3 puns in the name, right? But, tell us the story behind the name, and how you came up with it? F Geyrhalter: Oh, don’t say them. It’s not good for your brand. Don’t say these. Raissa: We could remember was like Double-Dutch and we felt like “oh my God, that’s such a good name. It’s catchy and like really suits us.” What you see it is like at least 3 different types of meanings that are so relevant for us because obviously we’re Dutch twins, so Double-Dutch. Its double flavors. All of our flavors are Dutch-Double. Then speaking Double-Dutch, if you’re a bit drunk. F Geyrhalter: I didn’t even think about that. Raissa: So yeah I think, I love the name and it gets so much good feedback that the name makes a whole brand. F Geyrhalter: Great. I have one to add. I was thinking about the rope jumping double-dutch and that is kind of like mixing, right? You’re constantly shaking and you’re moving. It’s so many good thoughts and the name just arrived in one drunken evening, which is how the brand should have been born. I mean it makes a lot of sense for your brand. Let me read a few lines from your website. “From the world’s best mixologists trough to those who prefer their G&T on the sofa at home, the Double-Dutch twins have created revolutionary mixers to intensify enjoyment of spirits, or to be drunk solo.” It’s actually really funny that the copy you decided to write and another line is, “the perfect twin for your spirit.” So, how was that brand voice crafted? Did you hear copywriters to a certain point? Are you working with an agency? Or, is it the two of you, like organically changing the copy on this site. Raissa: It’s definitely more organic, just kind of randomly coming up with different slogans and then they just stick. Along the way, we’ve worked with a few copywriters, but it’s definitely more just friends and the team that just constantly, organically, change it a little bit more. F Geyrhalter: Great. When, did you actively start investing in branding? I’m sure that packaging design is so important. The look and the shelf appeal and in the bar, and the entire spirit industry is really based on packaging design. How did you go about that? Was that very organic too? Or, did you do a lot of research and A/B testing? Did you hire a designer? How did that go about? Raissa: I think naturally from day one, we knew what we wanted to stand for and what our identity should be. We knew how we wanted to have our brand come alive. We knew we wanted to have it like a general brand, firm, innovative, young, natural, healthy, colorful. So, I think, with that we initially had different types of labels which were really not great. But we brought that to the markets, knew that they were not great and then really listened to feedback of our customers, to see what they wanted to see in our branding, in the whole vision. It quite quickly became clear that they really wanted to see the story in the whole branding. So, we, after 6 months, after we launched, we used a branding agency and they were really amazing. We gave them the brief, like what we really wanted to see and they completely visualized it in our labels. They made a brand identity for our website and just really turned that around. F Geyrhalter: That’s fantastic. It makes a lot of sense, that journey. The two of you being so part of your own brand and you having established a quite amazing brand, at a very young age. What does branding mean to you? Because branding is such a nasty word. A lot of people feel like branding is just the logo but it’s so much more. What does it mean to you? Raissa: I think, brand is really about feelings, not facts. It’s about who you are, what you stand for, what your identity of your brand is and it is your whole company, basically. It’s definitely just not a label, or website, or social media. I think, it’s really important that a brand should trigger feelings with your consumers and customers. F Geyrhalter: Right? The last couple of years, most probably. One day it was a win, and one day it was a fail. Joyce: Well I think, what we didn’t do from the beginning, if we would start all over, I would put much more focus on bringing one identity together. What we didn’t do is bring it all the way 360 degrees. We made a website, we made the label, and then we had the leaflets. I think everything was not one entity, and we should have defined everything in one entity, sooner. Going from exhibition stands, has the same look and feel as our social media to our texts on the websites to the labels, to the fonts, leaflets and think our whole branding. It took us quite a long. It was a very step by step that we brought everything together. I think that it could have probably been much quicker. F Geyrhalter: It’s when cohesion that is so important, especially in the beginning. It’s so difficult as a startup entrepreneur to say, “let’s stop right now when we have traction, let’s stop and really analyze the branding, create that style and say this is us and we’re just going to use those two colors, those two fonts, this is our tagline, this is our look and feel.” It’s so difficult when you’re in amidst of it, which is like take that breather and say “no, let’s do this professionally and let’s step back.” It’s actually exactly what I do with my consultancy because I go to startups and say, “look, now it’s the time to stop and now we actually need to do all of this and you’re going to be back on the road in one month.” But, I totally understand that it’s super difficult to do that. Especially, because that’s the time where you start meeting consumers because you need leaflets, you need the packaging, you need to get out there. And it’s hard to like pull back at that point. F Geyrhalter: So, listeners who fell in love with your brand, just now, where can they find Double-Dutch? I know we have them a majority of listeners, here in the U.S. But, right after that there’s the U.K. which I know you’re widely available. Then there’s Belgium which it sounds like you should be available and then we also have a lot of listeners from Australia and Spain. In which of these countries can my audience start mixing up the best Gin Tonics ever, tonight? Raissa: You can find this in all those countries except for the U.S. We’re only starting in the U.S. in about 5/6 months. We’re just seeing who the best partner is. But, keep an eye on our Instagram. Its called ‘Double Dutch Drinks’ and we’re announcing our new places. But, we are in Belgium, we’re in the U.K. We’re widely available going from thousands of different bars, restaurants, hotels to Ocado, Amazon, Fortnum and Mason, Selfridges. We’re launching in Waitrose in May and then in Spain, we’re in lots of bars and restaurants. In Australia, we actually just launched. So many many places. But, do send us an email, either on Instagram and follow us on social media and we’ll definitely give you a list of where you can find us. F Geyrhalter: Well, fantastic! And I also sent you my mailing address, hint. Thank you both. This was so much fun and insightful. I really appreciate you taking the time from running your company. Having both of you here is so amazing that you’d share your stories with our listeners. I’m super super grateful for your time. Raissa: Thank you so much for having us. F Geyrhalter: Absolutely, and thanks to everyone for listening in, for hitting the subscribe button and giving this show a rating. It means a lot to me to help spread the word about hitting the mark, to founders and investors around the world. This episode is brought to you by another London based brand, Mister Maginsky, possibly the greatest invention in men’s underwear since men’s underwear, itself. Find out more and grab a double pack today at mistermaginsky.com. The Hitting the Mark theme music was written and produced by Happiness Won. I will see you next time, after I’m having myself a quick Gin Tonic, when we once again will be Hitting the Mark.